Not only would it be mac ‘n cheese, it would be vegan (because that way it’s lower in fat and cholesterol, for a healthy family dish), it would be dairy free because it’s vegan, and it would be odd and delicious and completely healthy in every way. Oh… oh wait! I was on Iron Chef… Blogger Iron Chef. 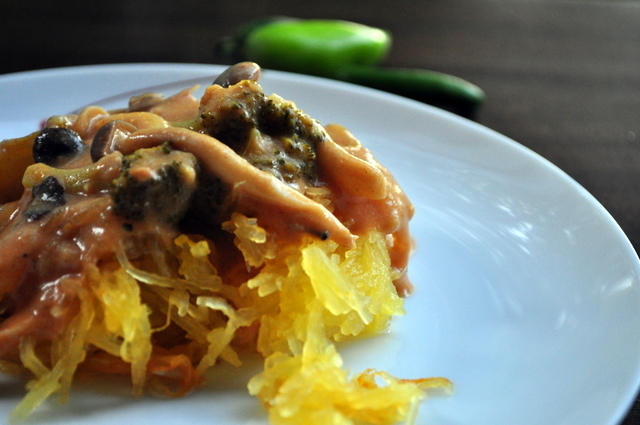 The secret ingredients: Spaghetti Squash and Jalapeno. To work I got… The results? An all-natural variation to the kid-friendly classic, Mac ‘n Cheese. Kids will love it, adult will savor and enjoy it. Made with no animal products, no dairy, and no gluten, this high nutrient powered meal will be a favorite in your house, too. Recipe adapted from Chef Chloe’s recipe for Vegan Mac n’ Cheese. Serves 4 healthy and thriving family members. Preheat oven to 375 degrees. 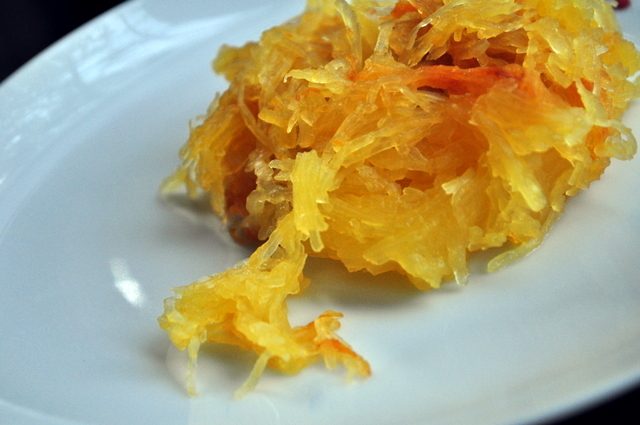 Carefully cut spaghetti squash in half, lengthwise, scooping out seeds from the center. Discard. Place cut-side down on a parchment lined baking sheet and bake for 1 hour, or until the center of squash is tender when poked with fork. Meanwhile, in a medium saucepan, heat oil + 1/2 cup of water and add the mushrooms to the pan. 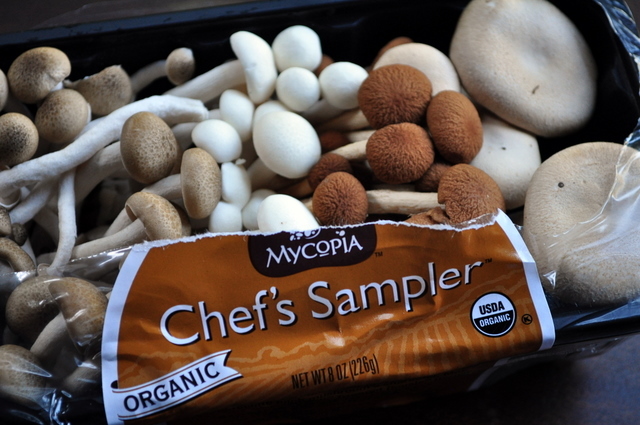 Soften mushrooms for 5 minutes then add the flour, almond milk, nutritional yeast, tomato paste, salt, miso paste, and garlic and paprika powder to the saucepan and bring to a boil, stirring frequently. 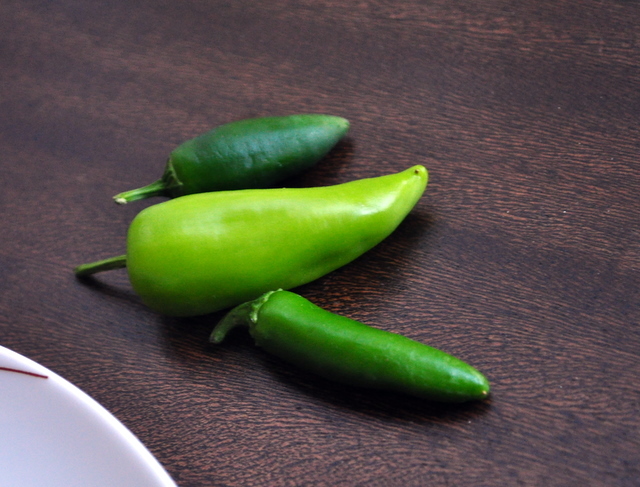 Add in chopped jalapenos to your liking, seeds add the spicy heat and are always optional. Reduce heat to low and let simmer until the sauce thickens, making sure to stir out any clumps of flour. Adjust seasoning to taste and stir in lemon juice, dash of Stevia, and broccoli florets. Remove squash from oven, when done, scrapping out “noodle” flesh of squash into a large bowl. Toss “cheese” sauce and squash together. Serve immediately and enjoy. 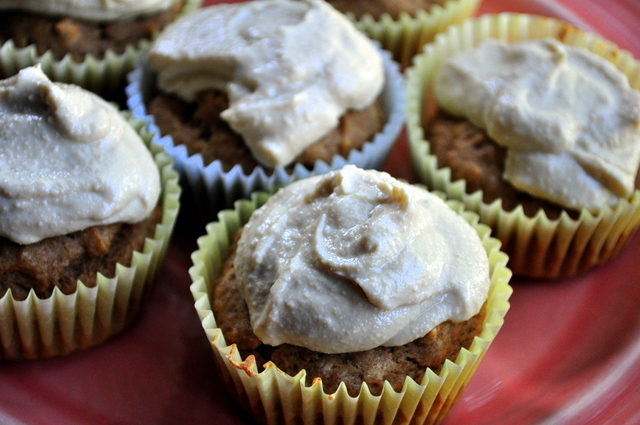 Finish off the meal with a healthy dessert of vegan cupcakes with honey lemon (healthy!) frosting. After you see this recipe on Monday, you’ll never go back to another cupcake recipe again. I PROMISE you that. So, what do you think? A dish worthy to compete for Blogger Iron Chef? Or would it be Blogger Cyber Chef? Either way, it was a fun challenge! 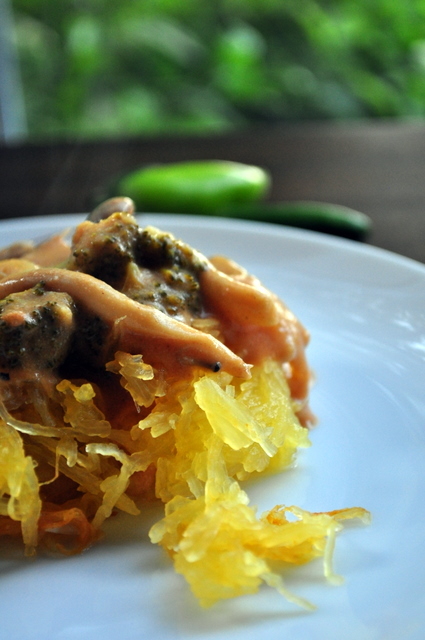 What would be your entry to Blogger Iron Chef with the secret ingredients being spaghetti squash and jalapenos? *Ahem* I didn’t even need to be on Iron Chef to meet one of the famous chefs! Remember the Food & Wine Festival…? I love awesome times. Love it Lori! That sounds just amazing – and do I see a little spelt flour snuch in there? Sounds like a great challenge and I love what you did with it. Sounds just so delicious, and the gluten free part is a huge bonus. dang this looks amazing – I am going to have to try! a group of our friends used to get together once every couple months for Iron Potluck – we’d have a secret ingredient, and the winner would host the next dinner at their house, and pick the next ingredient. it was so fun! i love the idea of adding tomato paste to a vegan cheese – i bet it adds a TON of umami & flavor! genius! 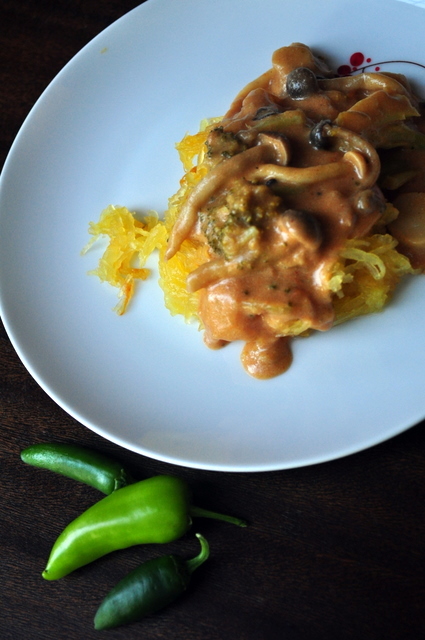 those mushrooms are calling my name – i might try your recipe & leave out the nutritional yeast (never have liked it) to make a mushroom-y s’ghetti squash dish! You are SO CREATIVE. I wish I’d seen this post BEFORE I went to the farmer’s market : ( Totally would’ve stocked up! Gosh Lori. You are a genius. love it!!! youre so brilliant, you know that! yum yum I take a plate! and love the iron chef blogger idea too cute! Jalapeno mac n cheese?! That sounds so bomb! Been thinking of you a lot lately Lori, and your family. I hope all is well 🙂 Have a wonderful weekend and hopefully I can see you in the nearish future! Next post: Outstanding Vanilla Cupcakes. Fluffy, Sugar-Free, Vegan, and Still Delicious.